Most people take pains to avoid illness. For Andrea Avigal, purposefully injuring herself and making herself sick provided a respite from the horrific homelife of her childhood. Raped, demeaned, and beaten by her father, she grew up thinking she caused her own abuse and believing it was her responsibility to put things right after her parents fought. Hurting herself meant her dad wouldn’t assault her and her parents wouldn’t argue while she convalesced. In adulthood, Andrea’s childhood traumas weighed heavily upon her. She would make herself sick by injecting herself with bacteria or restricting food intake to the point of hospitalization. Her frail state interfered with her ability to be a functional, loving wife and mother. She held herself responsible for her son’s death from cancer, and neglected her surviving daughters and husband. Into this situation stepped psychiatrist Thomas Hall, whom Andrea began seeing for therapy. After much intense work, Andrea received many diagnoses, one of which was Factitious Disorder (FD), otherwise known as Munchausen Syndrome. 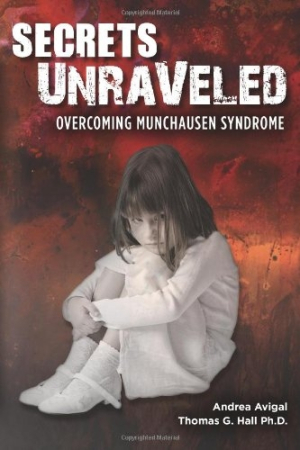 The essential feature of this illness is the compulsion to hurt oneself or make oneself ill. Told from the alternating points of view of Avigal and Hall, Secrets Unraveled: Overcoming Munchausen Syndrome offers a fascinating look at the effects of mental illness and the therapeutic process. Many books are written about patients by therapists, but there are few patient-therapist collaborations in which each voice is heard. Avigal’s narratives allow readers to see her for who she is, not just merely for who Hall thinks she is. Their various perspectives are sometimes at odds, but the presence of Avigal’s voice makes her jump out as an active participant in her own treatment. Both patient and doctor possess keen intellectual insights, but their stories hammer home the truth: it is much easier to recognize an issue than it is to fix it. As Avigal struggles with the desire to be Hall’s special patient and Hall grapples over how to interact with her, one sees that both counselor and patient are fallible—an important lesson for those who put doctors on a pedestal. The pair’s example also illustrates the arduous process of setting up and maintaining personal boundaries. Although Hall and Avigal experience some bumps along the way, the entire book is a moving and inspirational testament to the power of the healing relationship when clients find optimal therapists. Avigal’s relationship with her family and Hall’s rapport with Avigal’s other medical providers are also problematic. While Avigal’s illness by definition renders her self-involved, one empathizes with her as she tries to be a better parent and spouse, even as she fails to adequately take care of herself. Readers will likewise sympathize with Hall’s frustration as he navigates the health-care maze on Avigal’s behalf, trying to convince her other doctors that she indeed has FD and needs specific treatment. The lucid, poignant prose of Avigal and Hall sheds light on FD, the complexity of relationships, and the resilience of the human spirit.